Wayside power systems are designed to feed 480 volt, three phase power from the electric utility to the train through the HEP system or a dedicated "yard power" connector. These systems have been referred to as "Yard Power Units", "Wayside Power Units", "Wayside Power Systems", "Wayside Power Panels", "Shop Power", "Ground Power" or a number of similar terms. Providing standard utility power to the train for maintenance or layover is far cheaper (and quieter) than running on-car generator sets or providing HEP power from a locomotive. In enclosed car shops there is no ability to run the on-car generators anyway due to the exhaust. Northwest Rail Electric wayside power systems are the NW-YPHP series of model numbers, with the various letters and numbers following indicating the capacity and various custom options. Customers using Northwest Rail Electric NW-YPHP systems range from small car storage and maintenance operators to railroad museums, tourist railroads, commuter operators and intercity passenger train operators. Plug the HEP Control Loop Jumper hanging from the wayside HEP power unit into the receptacle side of the HEP trainline on the end of the passenger car. Plug the 480 volt, three phase HEP trainline into the wayside power unit using the HEP system plugs. If the top (yellow) button indicator light turns on, then the trainline control loop is complete, and it is safe to start feeding power to the train. Press the top button to start feeding power. 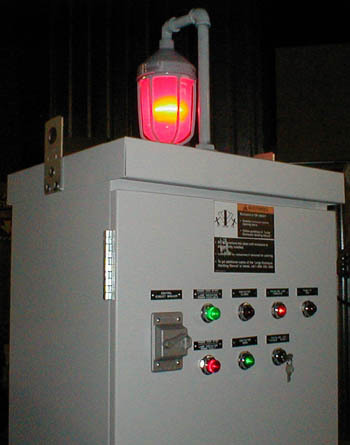 The bottom (red) light turns on when power is being fed to the train from the wayside power unit. To stop feeding power to the train, press the bottom button. 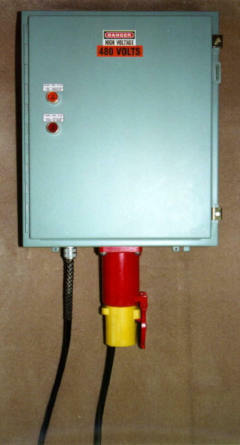 The YPHP is equipped with a three phase power monitor that will shut off the power feed in the event of phase imbalance, or improper phase rotation. Stainless steel enclosure (illustrated on system on near right) or powder coated mild steel (far right) enclosures may be required or desirable in various situations. A variety of control layouts may be provided, depending on the requirements and customer desires. Note the unit at near right has a vertical control format while the unit shown on the far right has a two row horizontal control button layout. Various contactor brands or circuit breaker brands may be required by specification and these have been accomodated. Main high voltage circuit breaker may be mounted in the enclosure, or the circuit breaker located in the breaker panel that feeds the yard power unit may be deemed sufficient, depending on location, sight distance to the unit and local requirements. Built-in transformers and standard 120 volt receptacles for operating utilitiy lights, power tools or other maintenance equipment from the yard power unit have been supplied on some systems. If equipped with a circuit breaker, the main high voltage circuit breaker inside the NW-YPHP may be entirely within the enclosure, or be interlocked with a switch or lock on the door so that the circuit breaker must be shut off by the exterior switch in order to open the enclosure door. Large roof-top indicator lights mounted on top of enclosure so that conrol loop complete and/or feed indicating is visible from other end of yard. (There are two such large rooftop lights on top of the NW-YPHP shown at far right.) Various options include a rooftop light that only indicates loop complete when connecting the HEP connectors or various more complex indications. Enclosure heater, ventilation and insulation to meet the needs of the local climate and the requirements of the customer. Custom connectors and other custom features have been provided for charging battery powered locomotives or energizing locomotive hot start systems. cover so that even when padlocked it is possible to see the position of the locked switch. These systems are fairly long lead tme items. As specifications differ from one transit agency, long distance railroad, or maintenance shop to the next and one location to the next, as well as power requirements due to train length operated on particular routes, it is not possible for us to construct these as a stock item and have them ready for shipment upon receipt of an order. These systems become particularly long lead time if the enclosure size is custom or the hinge location, door type or other aspects of the enclosure must be custom fabricated to suit the location. Custom enclosure types also increase the cost of the systems significantly, and therefore there is a huge payoff to plan ahead of time when working with the system location, so that a custom enclosure type is not required. Various indicator light systems may be required. This may only be a large light on top of the box, but if there are obstacles such as station platform roof pillars or other various constraints, it may be necessary to adjust the position of the indicator light so that it may be seen from the required location. 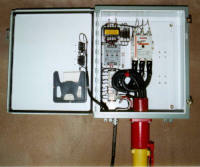 At right is an example of one such system that required an extension and position change to the box top indicator light. The system is shown being tested in our shop, and therefore the station roof, fire sprinkler pipe, and various other obstacles which required this modification are not shown. Location is also a factor when considering the cables that must run between the power system and the end of the train. These cables weigh approximately 3 pounds per foot of length, and generally in most jurisdictions anything over 25 feet is considered too heavy to be humanely moved. Instead, cables of longer length must be moved by pallet and forklift or more than one person. The added effort and equipment required to move excessively long cables, plus the extra purchase price required to purchase these longer cables, as well as the tripping hazard the cables represent when they are on the station platform, all need to be considred when deciding on a location for a wayside power system. If electrical drawings are provided with the specification, be very careful what is specified in the drawings. In many cases we have found these drawings to have been incorrectly adapted from other locations or situations that are inappropriate. For example, in one particular situation the electrical drawings provided by the specification required the system not have enough power capacity to feed the trains operating on the particular route in question. We have seen enclosure heaters specified for units operating in warm climates. We have seen units without enclosure heaters specified for use in cities with very cold winters, where ice will form on the electrical components if these heaters are not present. Northwest Rail Electric prefers to be involved early in the unit specification process so that we are able to work with the specifications so that we are able to build a system that satisfactorily meets the operating requirements of the particular location. Avoiding these problems early on prevents expensive changes later. Various local requirements may determine if a main circuit breaker inside the system is required, or if the circuit breaker feeding the system from the circuit breaker panel is adequate. Points to consider in making this determination include if the location being fed is within sight of the main circuit breaker panel, or various other requirements that vary with local regulations and shop practices. Providing a circuit breaker inside the NW-YPHP unit significantly increases the cost. If the unit is equipped with a main circuit breaker, there may also be a requirement that there be an external method of shutting off this circuit breaker before the door is opened. We have built several custom variations in recent years. For more information see our Custom Yard Power Units page. These systems are a vital part of maintaining and operating railroad passenger equipment, and virtually any needed or desired feature may be provided. Northwest Rail Electric can help you determine what features are desirable, from extremely simple systems such as shown at the top of this page to the more complex and custom systems. We are able to provide a number of different extension cables for connecting the train to the system as well. Contact us to determine pricing for the particular cable length that you require.